So here's the deal: the following are by no means baby items you must have to be successful at being a mom. However, they are things that I have found very useful over the past almost eight months of baby raising, and I wanted to share. I chose these specifically because they are things that you might not normally think you need, so they probably won't end up on too many "must have" lists out there. Feel free to add yours in the comments below! 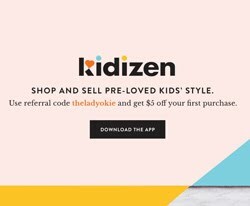 *This post is not sponsored and there are no affiliate links because, as I've already mentioned, I don't know how to do that, and it probably wouldn't be worth the 15 cents I would get to figure it out. YOU GUYS. I. love. these. bibs. I came across these for the first time on a blog (can't remember which one now! ), and I had to buy some for myself because duh, they are cute. But I quickly fell in love with them because they are so absorbent for baby drool. They have a double layer of cotton on the front and polyester on the back, and R can soak them sopping wet, but they don't soak through on the back. I'm telling you. You need these in your life. Okay maybe you do have this on your registry, but it's one of our most useful baby purchases. You hook this to the backseat, and I love being able to see R in the rearview mirror while I'm driving. Without, you know, turning around and being really unsafe. When we are in a different car, I keep looking in the mirror to see her and am sad when I can't. 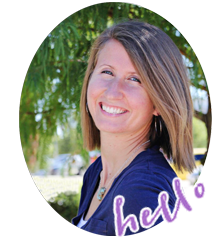 I am convinced that Sophie the Giraffe is like the cool baby toy of bloggers everywhere. 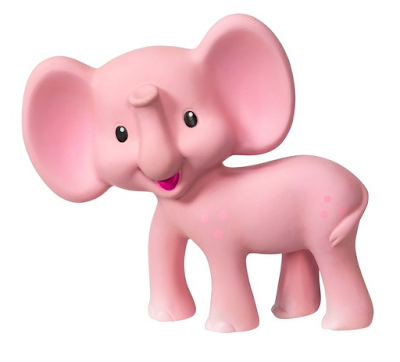 But I swear that Kiki the Elephant is better. She comes in pink or gray for a gender neutral option, and her ears are the perfect size for chewing. R absolutely loves her elephant! Kiki is made out of the same material as Sophie, is the same brand, and squeaks just like Sophie does. Kiki really doesn't get enough love, in my opinion. Dare to be different. I linked to Covered Goods only because that is the kind I have, but there are a few different shops that carry this type of stretchy nursing cover. I actually did a review on the blog of this nursing cover, and I am even more of a fan than I was initially. At that point R and I were still getting the hang of nursing, and to be honest the cover was kind of a pain. But it came in super handy on our recent vacation! I used the cover to nurse on the airplane, in the airport, in the car, as a blanket, and to shield her from the sun in the carseat. Super handy! And it's lightweight and folded up easily in our bags. My poor baby has some serious dry skin issues, and our pediatrician recommended the Aveeno eczema therapy lotion for her. Jordan actually uses the adult version (not sure what the difference is, to be honest) on his chin when it gets super dry. This lotion is very creamy, doesn't have a strong smell, and seems to help with her eczema issues. We rub it all over after a bath and any time we noticed dry patches (like one on her forehead that's been acting up). I highly recommend picking up a tube of this lotion! So those are a few things we have loved over the last eight months. Feel free to share some of yours in the comments. Is there anything awesome I'm missing? I agree that the car mirror is super helpful. I can't imagine not being able to see her while I'm driving! Also...thanks for the tip on the eczema lotion. I've been hunting for something that helps. I'm pretty sure my son will be exclusively wearing those bandanna looking bibs. They are the cutest and we already have a ton! Whoops. I got mine off of Amazon so fingers crossed they do the job like the ones you mentioned!! I already have my car seat and mirror set up and I look at it longingly all the time. I just can't wait until there is a baby in there!! Haha, I did the same thing! After my first I was so utterly wiped out I think I got out of bed twice the entire 2 days afterward and I KNOW I didn't brush my teeth. It got way better every other time. 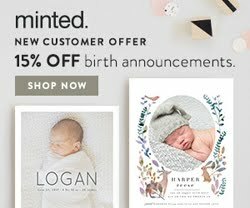 I'm 17 weeks along and this is so timely! I'll be pinning these right away. Thank you! I've never even heard of Kiki! H really has no interest in Sophie (bc it seems kind of awkward to hold and chew on for him), so we might have to give Kiki a try. The mirror is definitely one of my favourite things. You get to spy on your newborn when you're still the over paranoid new mom, and when they're in the bigger seat they can stare at themselves, too. Parker loves gazing longingly into his own eyes. I have a nursing cover infinity scarf, but it's not as good as those Covered Goods ones and I am always so envious. Totally agree with all these things (except the nursing cover, but that's mostly because I truly haven't figured out how to use mine sucessfully!) - we LOVE our Copper Pearl bibs! 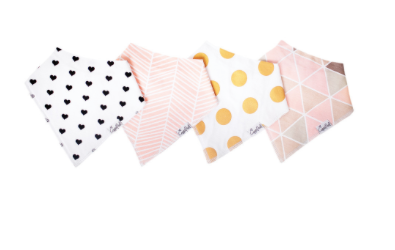 I ordered them randomly from Amazon after someone told me about "bandana bibs" in general, and the brand totally worked out. Connor wears one almost every day, and I love them because his onesie stays dry no matter how drooly he is! As for the skin issues, we use Eucerin Baby Eczema lotion, but use Aveeno Baby sensitive skin bath wash and shampoo, and it has really seemed to help his exceptionally dry skin. I pretty much support Aveeno anything; it's great for babies and adults! Jack has started drooling like a maniac this week, so I'm definitely going to buy some of those! And I don't know why the mirror doesn't make it onto more lists...it's so helpful and important! Yay! I'm glad you shared this! Those bibs look/sounds awesome. 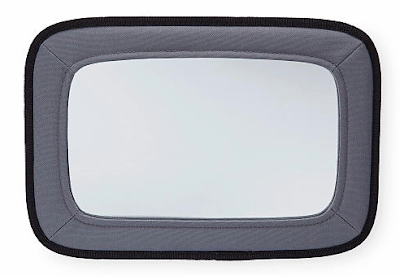 We registered for a car mirror, so I'm glad to hear that's a favorite of yours. I've also heard really good things about Aveeno's baby products in general- lotion, shampoo, etc! We have the pink Kiki also! She's so much cheaper than Sophie and works just as well -- why is Sophie sooo expensive? I need to check out those bibs, my baby is a drooler! Honestly maybe she's too young to really appreciate Sopie, but Ava is not that interested in her. She'd probably like Kiki better. 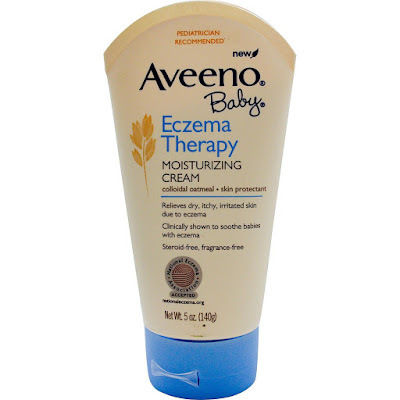 Caleb actually uses that Aveeno (not for babies, obviously) eczema lotion religiously. He loves that stuff, so I can imagine the baby version is even softer!! :) I am saving this post for a future date. The elephant is so stinkin cute! Yes to Kiki! Caleb actually has the deer named Lela since I wanted him to be different and not a Sophie follower. ;-) He loves his Lela and still chews on her when he's teething. 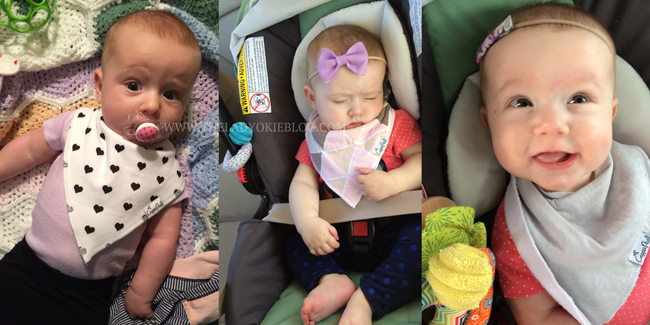 those bibs are adorable and kiki is WAY cuter than sophie.